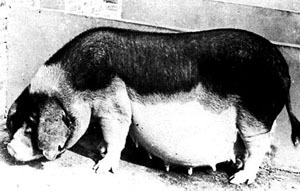 The Ningxiang pig is raised primarily for lard. The breed is of the Central China type and originated in the Hunan Province of China in the Central Subtropic belt. The breed is normally housed and hand-fed year round. The hair coat color pattern has been described as "black clouds overhanging snows with a silver ring around the neck"; the back is slightly concave, and the belly is pouched and pendulous. 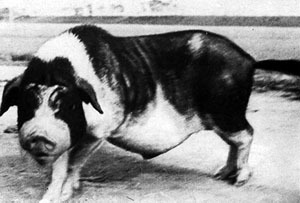 The back fat is 4 cm thick; the average litter size is 11.5 and there are 7 pairs of teats. Porter, V. 1993, Pigs - A Handbook to the Breeds of the World. Cornell University Press, Ithaca, 256 pp.